A little over a month ago, on March 16, 2008, I wrote an entry - which you can read again by sliding over and clicking on the March 2008 Archive on the right side of the page and scrolling down to it - which addressed My War, CBS commentator Andy Rooney's personal memoir of his time as a correspondent during World War II. When I wrote that entry I was having a tough time getting through it, even though it's far from a challenging read. I just kept getting mad at Rooney, so I'd put the book aside. Well, I finally finished it. Within a couple pages of the end of his book Rooney talks about his impression that it is difficult to capture the real essence of a war in a book or movie. I'm going to quote several paragraphs from this thread of commentary exactly. Once you read it you'll understand why. One of the most dramatic educators has been Steven Spielberg. It surprised me tha t I'd ever think a commercial movie could do a good job showing people what any part of World War II was like and, in spite of my reservations about Schindler's List, the 1998 movie Saving Private Ryan did that for a great many Americans who might otherwise never have known. I admired Saving Private Ryan more than I enjoyed it. Being reminded of bad times in your life is not my idea of a good time. It is common knowledge that many Americans who fought in Viet Nam were psychologically damaged for life. The terror of it returns to them in nightmares. But the common perception is that most of the soldiers who fought in Europe seem to have suffered somewhat less of that kind of cerebral damage. It had never occurred to me that there were any ghosts in my own attic until I sat there watching Spielberg's movie. At the end of the unrelentingly horrible scenes of the Normandy Invasion there was a change of pace, a lull. I don't cry in sad movies but at that point in the movie I began to sob. I was rational enough to try to understand what was making me do it, but I could neither understand nor stop. It was another example of the heart knowing something that the brain does not. In retrospect it was apparent that there must be a storehouse in some hidden corner of my brain that contains fragments of my memory of a hundred friends who were killed. Private Ryan evoked those. I went home thinking about all the friends I never saw again... all the good guys who never had the chance to live the good life I'm living. The movie is remarkably accurate in both historical and visual detail. after seeing it, I telephoned my friend Al Smith, Major General Al Smith, Jr., in Tucson. As a captain, Al led a battalion of the Sixteenth Infantry Regiment of the First Division ashore that day. There are only a handful of men alive who saw what Al saw on June 6, 1944. He had also been moved to tears. "My wife looked at me as we left the theater," Al told me, "and said 'I don't know what to say.'" After living with Al every day of her life for the previous fifty-five years, she got a better idea of what he had gone through from seeing Saving Private Ryan than she had from anything he had ever told her. I have to agree with Rooney on his observation. I suspect he would have been similarly moved by the HBO series, A Band of Brothers - produced by Tom Hanks and Steven Spielberg - which followed Easy Company through their years in World War II, except it was produced after Rooney's book had been published. Now, I have to tell you right here that I'm a big movie fan. I see a lot of films during the year - I have ever since I would walk down to the local theater and spend ten cents to see 10 cartoons, two serials and a western on Saturdays. My favorites include a couple of John Wayne epics, Stagecoach and The Searchers, most Indiana Jones movies, Henry Fonda's Twelve Angry Men and - right at the top - Saving Private Ryan. When I say "right at the top", that means that I've seen the complete movie more than a dozen times and big chunks of it nearly as many times. I saw it at the Big Newport theater the first night it was released ten years ago and four more times during that run. The first night was the most memorable - not for the movie itself, but for what I observed during that presentation and immediately afterward. I went to an afternoon presentation, which was populated by mostly older couples - folks who could have been my parents age. I found myself thinking that many of the men in the audience certainly had been in World War II. The couples smiled, laughed and talked as they found their seats and began munching popcorn. During the movie, following that horrible first twenty minutes that portrayed the Normandy Landing, I, too, heard muffled sobbing in the theater, some of which obviously came from men in the audience. When the movie ended and the credits rolled there was just silence, punctuated by sniffs and some sobbing, as the theme by John Williams just reached right in and pulled your heart out of your chest. My wife and I left our seats and, as I surreptitiously wiped the tears off my cheeks, moved out into and through the lobby to the patio at the front of the theater where I watched the older men and women as they made their way out. Most of the men had a kind of far away stare on their faces and their wives clung to their arms tightly - I'm not sure which was holding the other up at that point. There was very little conversation among the couples - just an almost reverent silence as they slowly made their way to their cars. News reporters hovered around the older couples, trying to get comments from the men as they left the theater. Many were so choked up they couldn't speak. 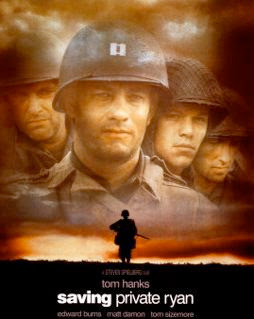 Personally, I had never before, and have never since, been so moved by a film as I was by Saving Private Ryan. Even today, at the end of the movie as I watch the James Ryan character as an older man, standing beside the grave of Captain Miller, ask his wife if he led a life worthy of the sacrifice made to bring him home I get a huge lump in my throat - just as I have now as I type this line. In his book Andy Rooney opines that he thinks Tom Brokaw, in his book The Greatest Generation, got it wrong. As indicated by the title of his book, Brokaw postulates that our World War II generation was, in fact, the greatest - that subsequent generations wouldn't have "the stuff" to pull through a similar war. Rooney thinks otherwise - that the current generation has what it takes to act similarly under the same circumstances. I'm not so sure. We live in very different times than those in which my parents and their peers struggled. They were born at the end of World War I and were young adults whose metal was tempered during the great depression of the 1930s. They understood sacrifice. Today many young people of similar age feel their world is ending if they lose a cell signal. Today we express anguish because just over 4,000 American men and women have lost their lives fighting in the Middle East over the past four years. My parents generation lost more than 450,000 young men in the same period of time, decimating a generation of Americans. Today I wonder if 10% of our young adults - 16 to 30 - could rise and sing the Star Spangled Banner accurately. My parents generation began enlisting in the armed forces beginning on December 8, 1941 by the tens of thousands each day - ready to do their patriotic duty to defend our country and our very way of life. Heck, many of their children - my generation - headed for Canada during the Viet Nam conflict. Different people, different times. So, even though Andy Rooney made me angry as I read his book, I'm grateful to him for re-kindling my appreciation for the sacrifice he and his generation made for us. The Greatest Generation is leaving us at a rate of more than 1,000 per day now. If you have not done so recently, seek out your friends and relatives who fought to defend this country and those who remained behind to keep the home fires burning. Listen to their stories and thank them for their efforts. They deserve it. 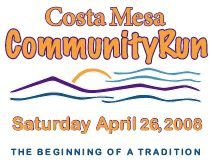 On Saturday, April 26th the first annual Costa Mesa Community Run will be held to recognize the grand opening of the new stadium at Estancia High School and to raise funds for programs at Costa Mesa's high and middle schools. Here's a link to the web site that will provide information about this very worthy event. This promises to be a very family-friendly event, including a pancake breakfast and Health Fair in addition to the running events. The organizers are still looking for sponsors, so open your checkbooks if you can. So, come one and come all. This should be a great, historic and memorable event. Well, the w onderful world of blogging has gotten a lot more interesting recently. A couple months ago an anonymous person who calls himself "John Smith" launched a blog he calls CM Watchtower. I'm still trying to figure out his focus, but he does have opinions - like most of us who thrash around in the blogosphere. Then, in the past few days, another anonymous blogger launched CM Truth, after the pen name he, or she, has used to post on this blog and elsewhere. There is no ambiguity about his focus, as you will see when you read his first few submissions. He writes about a person in town who used to be the subject, obliquely, of many posts here - but no longer. And then, over at the Daily Pilot, Managing Editor Brady Rhoades launched his blog, Rhoades Less Traveled. As I understand it, this will be the first of many such blogs presented by members of the Daily Pilot staff. The Orange County Register, which is rapidly becoming the news source of choice for greater Orange County, supplanting the Los Angeles Times, had a front page story today entitles, "THE NEXT BIG QUAKE", and included a photo of the San Andreas Fault to get your attention. It got mine. Here's the link to their story, with the byline of Gary Robbins, their "Science Dude", that predicts a large earthquake - 6.7 on the Richter Scale or stronger - within the next 30 years. Once there you will find other articles, one about Tsunamis, for example, that will also get your attention. Those of you who have read this blog for some time know that this is the second generation of A Bubbling Cauldron. The first, using what I referred to as a bargain basement blogging tool, was abandoned eighteen months ago. However, occasionally I'll provide a link to a specific segment to illustrate a contemporary point. This is one of those times. A few years ago, following Hurricane Katrina, I wrote an essay entitled, "The Big One - Fiction or Prediction? ", in which I presented a scenario in which the Newport-Inglewood Fault ruptured. You can read that essay by simply clicking on the title. It's never too soon to make preparations for a cataclysmic event. Earthquake preparedness kits for your homes and automobiles are essential parts of that preparedness. Now's the time - make plans for the safety and security of your loved ones when The Big One hits. The precautions outlined in those two sites and many others are simple, straightforward and easily followed. Don't delay.